Royal Mail 500 Tour reaches London, and Post and Go A009 comes out for the occasion. "Post and Go machine A009 will be attending an event to mark 500 Years of Royal Mail at Guildhall Yard, London on Saturday 18 June. 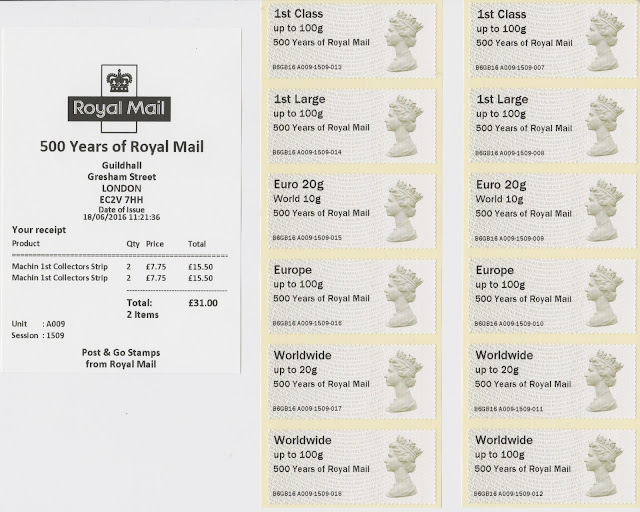 "The machine will vend the Machin stamp design with a '500 Years of Royal Mail' overprint. This is the same printing as previously issued at Stampex in February 2016. Royal Mail will also be offering a standard Smilers service." As postage rates have increased since February, the price of a Collectors' Set is higher and the receipt will be different. And of course the stamps will be different. There may even be Machins from both rolls. "Witness a replica horse-drawn mail coach journey from the Southwark's George Inn to Guildhall Yard in the centre of the City, where it will join a host of vintage Royal Mail vehicles including vans, motorbikes and a car from the Mail Rail network. "You can also join in a walking tour and take in the sites of the first postal buildings in London as well as Postman's Park (donations welcome). "Why you're there why not welcome Mark Penfold complete the final leg of his 500-mile walk from Edinburgh to London, as he raises money for The Lily Foundation. "The mail coach departs The George Inn, Borough High Street at around 11am and is expected to arrive at Guildhall Yard around midday (on display until 2pm). Thanks to Mike for this picture of the strips and the receipt. As Mike writes, there is nothing obviously remarkable here, other than there being two shades; neither has a year code. "Smilers were doing a good trade and seemed to be working okay, but would have been better had there been a 'generic' design rather than a need to supply a mugshot!!." With a mailcoach making a visit to the event, what a lost opportunity not to use the Mailcoach single P&G strip, as used at TPM.